The home entry door is usually the focal point of the front of the house. For this reason, many homeowners allow a good portion of the remodeling budget for an upgrade. There are more choices today than ever before. Front doors are available in traditional hardwoods such as Oak, Birch, Cherry, and more. Steel doors are becoming more popular and are no longer just for commercial buildings. A more energy efficient type is the fiberglass entry door. Its helpful to take a look at the advantages of each one to make the proper choice. After making this investment, its important to update the homeowners insurance policy. Remember, that is the replacement value of your home, not what the tax authorities tell you it is worth. 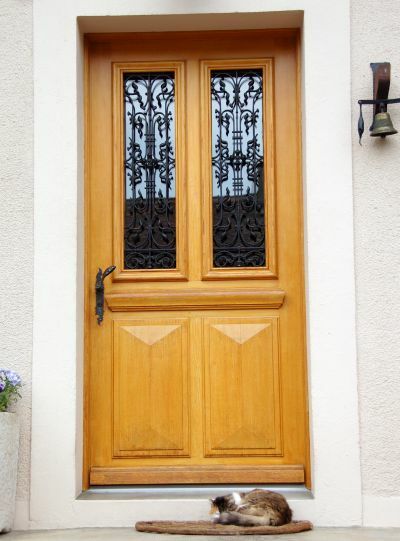 Wood entry doors have been around as long as there have been buildings to install them on. Where they were once the mainstay of new construction, today many entry-level homes are furnished with contractor-grade steel doors. In this case, a wood door is an upgrade. Popular hard wood species include White Oak, Walnut, Cherry, Honduran Mahogany, and Cedro Macho. Obviously, the more exotic the species, the more expensive the door is going to be. Many models replace side or upper panels with decorative or frosted glass. While this is attractive, it also takes away from home security and privacy to some extent. Wood doors do have drawbacks. For one thing, they are combustible. Another issue is that wood is a porous, organic material. If not properly sealed initially and touched up on a yearly basis, any spot open to the grain can cause it to absorb moisture and swell. In the worst scenario, the wood may split or rot. Steel doors have certain advantages over wood. They are heavier, more durable, and impervious to humidity and moisture. When painted, a well crafted steel door can be almost indistinguishable from their wooden counterparts. They also pose much less of a fire hazard. Metal will not burn as wood will, and must be exposed to extreme heat for an extended period of time before it begins to warp and buckle. One thing to consider is that once a steel panel is dented, its dented, although a homeowner with automotive body shop skills can make a reasonable repair. These entry doors may also be fitted with glass panels to dress them up. These panels are called lites. Popular ones are side panels, square-top, or ovals in the center of the door. Again, this may introduce a residential security risk. Fiberglass entry doors are a newer type than both wood and metal but enjoy some distinct advantages over both. Perhaps the most important advantage from a green building standpoint is that these doors can be very energy efficient. Many of them qualify for an energy tax credit, much the same as other residential insulating materials. Fiberglass will not crack, swell, or rot like wood will. Also, it will not dent like steel doors will. Since the material is lighter than the more traditional ones, this type of door may make life easier for the elderly and the mobility-impaired. The important thing to remember is that homeowners have several good choices when it comes time to dress up the front of the home.